IT'S WHAT YOU KEEP THAT MATTERS. 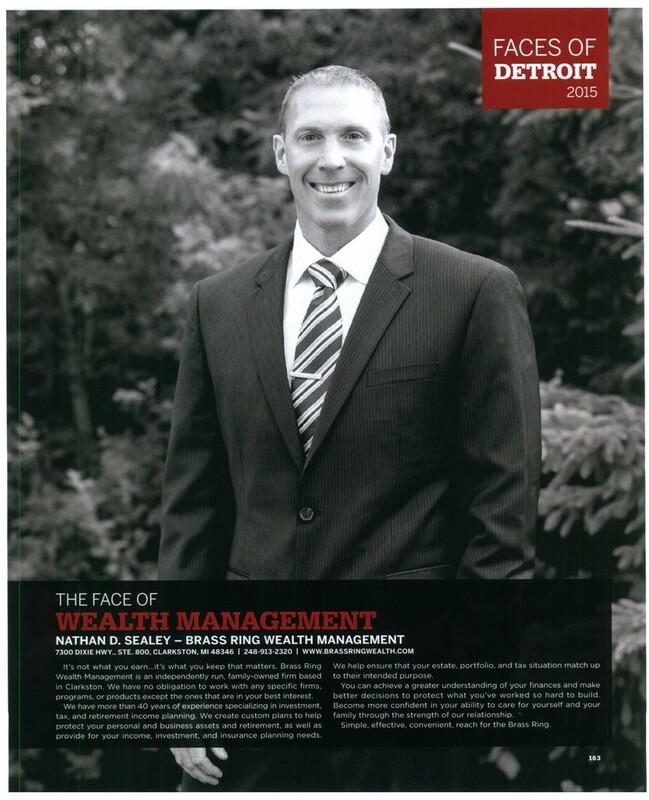 Brass Ring Wealth Management is an independently run family-owned Corporation based in Clarkston, Michigan. We have no obligation to work with any specific firms, agencies, or products except the ones that keep your interests in mind. Our professionals have over 65 years of experience specializing in investment, tax, and retirement income planning. Our custom programs help reduce certain risks that can harm your personal and business assets and retirement, as well as provide for your income, investment, and insurance planning needs. We help ensure that your estate, portfolio, and tax situation match up with the purposes that they are intended. You can achieve a better understanding of your finances and make better decisions to protect what you've worked so hard to build. Become more confident in your ability to care for yourself and your family by the strength of our relationship. Simple, effective, convenient, reach for the Brass Ring. © 2018 All Rights Reserved - Brass Ring Wealth Management Inc.
Securities offered through Kestra Investment Services, LLC (Kestra IS), member FINRA/SIPC. Investment advisory services offered through Kestra Advisory Services, LLC (Kestra AS), an affiliate of Kestra IS. Brass Ring Wealth Management is not affiliated with Kestra IS or Kestra AS. This site is published for residents of the United States only. Registered Representatives of Kestra Investment Services, LLC and Investment Advisor Representatives of Kestra Advisory Services, LLC, may only conduct business with residents of the states and jurisdictions in which they are properly registered. Therefore, a response to a request for information may be delayed. Not all of the products and services referenced on this site are available in every state and through every representative or advisor listed. Kestra IS and Kestra AS do not provide legal or tax advice. Any decisions whether to implement these ideas should be made by the client in consultation with professional financial, tax and legal counsel.For additional information, please contact our Compliance department at 844-553-7872.The above links are provided for your information only. As they are provided by third parties, Kestra Investment Services (Kestra IS) does not endorse, nor accept any responsibility for the content. Kestra IS does not independently verify this information, nor do we guarantee its accuracy or completeness. The Five Star Wealth Manager award, administered by Crescendo Business Services, LLC (dba Five Star Professional), is based on 10 objective criteria. Eligibility criteria – required: 1. Credentialed as a registered investment adviser or a registered investment adviser representative; 2. Actively licensed as a registered investment adviser or as a principal of a registered investment adviser firm for a minimum of 5 years; 3. Favorable regulatory and complaint history review (As defined by Five Star Professional, the wealth manager has not; A. Been subject to a regulatory action that resulted in a license being suspended or revoked, or payment of a fine; B. Had more than a total of three settled or pending complaints filed against them and/or a total of five settled, pending, dismissed or denied complaints with any regulatory authority or Five Star Professional’s consumer complaint process. Unfavorable feedback may have been discovered through a check of complaints registered with a regulatory authority or complaints registered through Five Star Professional’s consumer complaint process; feedback may not be representative of any one client’s experience; C. Individually contributed to a financial settlement of a customer complaint; D. Filed for personal bankruptcy within the past 11 years; E. Been terminated from a financial services firm within the past 11 years; F. Been convicted of a felony); 4. Fulfilled their firm review based on internal standards; 5. Accepting new clients. Evaluation criteria – considered: 6. One-year client retention rate; 7. Five-year client retention rate; 8. Non-institutional discretionary and/or non-discretionary client assets administered; 9. Number of client households served; 10. Education and professional designations. Wealth managers do not pay a fee to be considered or placed on the final list of Five Star Wealth Managers. Award does not evaluate quality of services provided to clients. Once awarded, wealth managers may purchase additional profile ad space or promotional products. The Five Star award is not indicative of the wealth manager’s future performance. Wealth managers may or may not use discretion in their practice and therefore may not manage their client’s assets. The inclusion of a wealth manager on the Five Star Wealth Manager list should not be construed as an endorsement of the wealth manager by Five Star Professional or this publication. Working with a Five Star Wealth Manager or any wealth manager is no guarantee as to future investment success, nor is there any guarantee that the selected wealth managers will be awarded this accomplishment by Five Star Professional in the future. For more information on the Five Star award and the research/selection methodology, go to fivestarprofessional.com. 3,069 Detroit area wealth managers were considered for the award; 322 (10 percent of candidates) were named 2018 Five Star Wealth Managers. 2017: 1,836 considered, 356 winners; 2016: 1,961 considered, 630 winners; 2015: 2,238 considered, 627 winners; 2014: 3,448 considered, 658 winners; 2013: 2,762 considered, 749 winners; 2012: 2,658 considered, 745 winners. Copyright 2016 - Brass Ring Wealth Management. All rights reserved.